Can Virginia afford bills in its drawer? The 2019 policy statements are now available on the VML website. The six statements reflect VML’s stance on issues and concerns that could be considered by the 2019 General Assembly. The statements were adopted by the membership at the business meeting during the VML Annual Conference in Hampton in October. 2019 Newly Elected Officials Conference will be held in Richmond at the Greater Richmond Convention Center (GRCC) 403 N 3rd Street. For more information about the Newly Elected Officials Conference, please contact Jessica Ackerman at (804) 523-8521 or jackerman@vml.org. 2019 Finance Forum will also be held in Richmond at the GRCC, 403 N 3rd For more information about the Finance Forum, please contact Neal Menkes at (804) 523-8523 or nmenkes@vml.org. For those who require lodging for either of the above events, we have secured a block of rooms at the Downtown Richmond Marriott 500 E. Broad Street, for January 7 and/or January 8. The Marriott is conveniently located next to the GRCC. You may use this link for reservations. For those who require lodging, we have secured a room block at the Omni Hotel January 23 and/or January 24. You may use this link for reservations or call (800) 843-6664. Can Virginia afford all the bills in the drawer? Shush, don’t tell anyone, but the 2019 legislative session really begins on December 18, 2018 not January 9, 2019 as advertised. Why? Because, on that December date Gov. Ralph Northam will introduce his amendments putting his imprint on the 2018-2020 budget, a budget which was originally developed by his predecessor former Gov. Terry McAuliffe. And with the submission of those amendments, members of the General Assembly will begin their scrambling and jockeying for policy objectives and money. Actions taken by the General Assembly in June 2018 put the Commonwealth in a strong financial position. 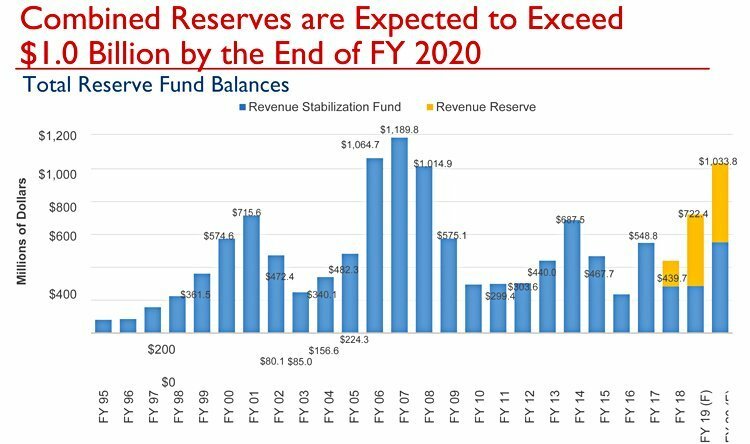 Deposits to the state’s Rainy-Day Fund and the newly created Cash Reserve Fund helped to persuade S&P Global Ratings to affirm Virginia’s AAA rating and to upgrade Virginia’s financial outlook to stable (the chart below from this year’s Senate Finance Committee Retreat shows the ups and downs of Virginia’s cash reserves). The better than expected revenue collections is likely to lead to a re-forecast of state tax collections in Northam’s budget amendments. Based on economics and actual year-to-date collections, Senate Finance staff expect overall general fund revenue growth of 3.3 percent in FY 2019 and slightly higher growth in FY 2020. 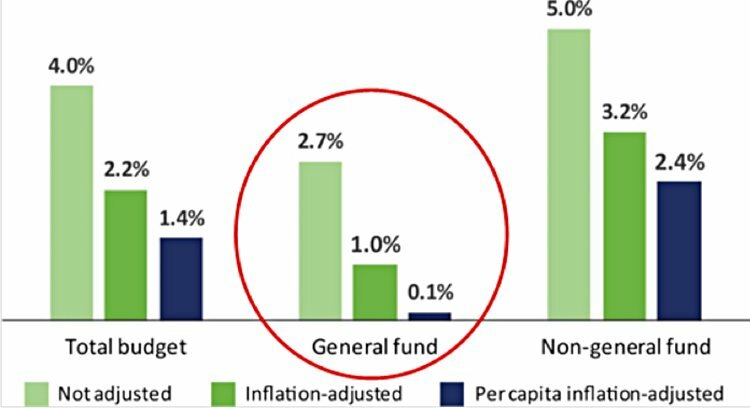 The good news on the general fund outlined above is tempered by the fact that over the past ten-years changes in inflation and population growth have effectively flattened general fund growth. The growth in the state budget has been stoked by non-general fund revenues such as college tuition, federal grants, fuel taxes, and special fees that cannot be appropriated for K-12 education, law enforcement and other programs of local government interest. The chart below (prepared by the Joint Legislative Audit and Review Commission from the Commission’s 2018 State Spending Report) shows the change in appropriations adjusted for inflation and population growth, FY09-FY18. Federal tax reform adds $1.2 billion in additional expected general fund revenues over the current biennium, driven chiefly from individual income tax collections. The General Assembly will have to decide how much of the revenue will be returned to Virginia taxpayers and how much will go to new spending. These decisions will be further complicated by two facts. First, the tax breaks for individuals provided under the Tax Cuts and Jobs Act are temporary and will expire. Second, the amount of additional revenue is likely to trigger constitutionally mandated deposits to the Rainy-Day Fund, perhaps in the range of over $200 million in FY21 and again in FY22. The ice is too thin to think these dollars can be used for permanent new spending. At the Senate Finance Committee retreat, staff identified a minimum of over $600 million in possible funding commitments and risks. It is interesting to note that these commitments and risks barely, if at all, touch on issues of interest to localities (see the chart below). Senate Finance staff also identified several other items of importance but did not assign price tags. These include replacing the state’s human resources information system, expanding broadband to unserved and underserved areas of the state, addressing deferred maintenance needs of state capital assets, and finalizing the state’s information technology “divorce” from Northrop Grumman. This list like the one above does not address local government concerns. Nor does it include increasing provider rates for physicians who participate in Medicaid, carrying out the provisions of the Amazon HQ2 deal, or meeting mental health challenges. Will the General Assembly find the will and means to increase funding for K-12 education, local law enforcement, local and regional jails, stormwater, and other state-mandated or state high-priority issues? The governor’s budget amendments submitted December 18 will be the first indicator to use to start answering these questions. Stay tuned. The Supreme Court is requesting comments on the proposed rules; comments are due by Dec. 3, 2018 and must be sent to Patricia L. Harrington, Supreme Court of Virginia, 100 North Ninth Street, 5th Floor, Richmond, VA 23219 or emailed with the subject line: “Comment on Access to Judicial Records” to scvclerk@vacourts.gov. There is a somewhat complicated backdrop to these proposed rules. In 2017 the Daily Press and the Office of the Executive Secretary (OES) were involved in litigation regarding the definition of “custodian of record” for the purposes of the Virginia Freedom of Information Act (FOIA). OES denied access to the records that the Daily Press sought, stating that the local circuit court clerks were the custodian of the records. Ultimately, the Supreme Court ruled that this denial was correct, but the litigation brought a swell of legislation during the 2018 session. Two identical bills – HB780 and SB564 – passed that required OES to create a nonconfidential database with public access by July 1, 2019. In the meantime, prior to the OES announcement, a judge ruled that the Freedom of Information Act did not apply to Virginia’s judiciary. He concluded that the judiciary and OES had sovereign immunity against FOIA lawsuits. We have yet to see if the General Assembly will take this issue up again this year, but there is a definite possibility. A new state policy focusing on quality, availability, and affordability of housing in Virginia is the subject of Executive Order Number Twenty-Five (EO25), which was recently issued by Governor Ralph Northam. According to the Governor’s office, the policy will address the shortage of quality affordable housing by coordinating economic development efforts with housing production, supporting housing production technology, and supporting regional and local pilot projects that increase the supply of affordable housing units. The effort will prioritize the development of affordable housing in close proximity to employment and educational opportunities. Finally, this effort will include work with stakeholders to reduce the rate of evictions across Virginia. The Commonwealth will evaluate potential pilot programs that provide eviction relief, counseling, and education services. Are economic storm clouds just over the horizon? The answer to the question posed in the title of this piece depends on who you ask, what evidence they cite and how far away you position the horizon. Many economists agree, however, that the economic barometer is changing and that the economic growth the nation has enjoyed since the end of the Great Recession will not last forever. The number of job openings in 2018 is expected to exceed the number of unemployed Americans. Total nonfarm payroll employment increased by 250,000 in October, following an average monthly gain of 211,000 over the prior 12 months. 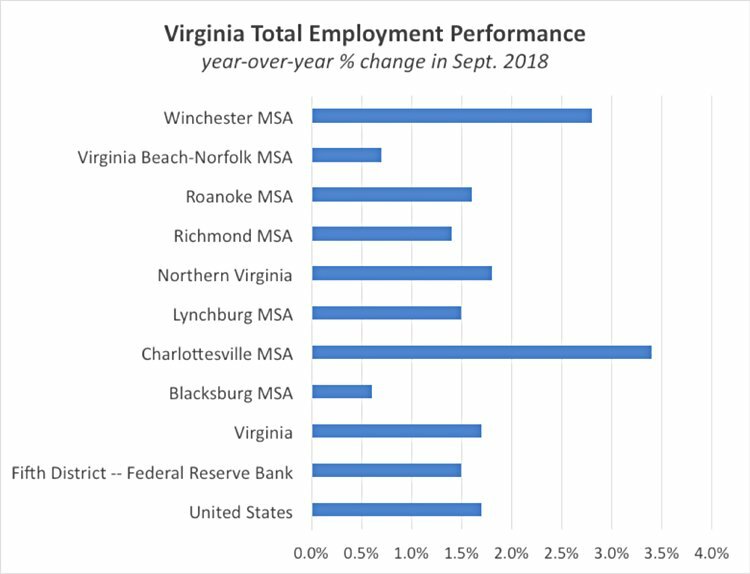 In October, job growth occurred in health care, in manufacturing, in construction, and in transportation and warehousing. The October unemployment rate of 3.7 percent is the lowest in years (see the chart below). Declining labor force participation rate – Even with a sinking unemployment rate, the percentage of Americans who are working or seeking a job is declining. The labor force participation rate – the proportion of the working-age population that is either working or actively looking for work – is an important labor market measure because it represents the relative amount of labor resources available for producing goods and services. In 1998, labor force participation stood at just over 67.0 percent. Ten-years later the figure dropped to just below 66.0 percent. In October of this year the rate was 62.9 percent. Of course, increased worker productivity and the passing of the Boomer Generation from the workplace to retirement partially explain the participation rate decline. However, the overall economic impact of this trend may mean a worker shortage is upon us. High corporate debt – Non-financial corporate debt is at an all-time high as a share of the economy with a significant amount of that debt ($1.3 trillion) working its way into the “leveraged loan” market where they are bundled into securities known as collateralized loan obligations and are sold to investors. In this manner, corporate loans rated BBB become AAA- rated bonds under the theory that although any single borrower might default, the chance that most of them would do so at the same time should be negligible. The Great Recession was preceded by a similar scheme in which household mortgages were bundled together as collateralized loan obligations. Although there are now laws and regulations to protect the financial markets regarding mortgage loans, unregulated lenders like hedge funds and private equity firms are free to continue this practice. The U.S. Court of Appeals for the D.C. Circuit ruled that non-bank entities that stitch together these corporate debt securities are exempt from federal regulations that require banks to hold on to at least 5 percent of these debt instruments. How big is corporate borrowing? In the last decade, the amount of corporate bonds outstanding nearly doubled to $9 trillion from $5.5 trillion with much of that surge ($2.5 trillion) in the form of bonds rated BBB, near the riskier end of the investment-grade spectrum. Which companies have gone on the bond binge? They include well-established companies such as General Electric, AT&T, CVS Health, Sherwin-Williams and Campbell Soup. If the economy slows and corporations have trouble generating enough cash to service their debt, the spillover will hurt individual Americans seeking to get or refinance a mortgage or get a car loan or a credit card. In other words, the ripple effect will resonate throughout the economy. Increasing federal government debt – The federal government has generated an additional $2 trillion in debt since 2017, bringing the total amount owed by federal taxpayers to $21.7 trillion. As the Federal Reserve Bank slowly raises interest rates the cost to service the nation’s debt increases, squeezing federal spending and capital needed by the private sector for business activities. Within a few years, the United States will spend more on interest payments than it does for the entire $400 billion Medicaid program. If that isn’t enough to cause worry, then consider that some projections show that shortly afterward the interest on the national debt will grow larger than appropriations for national defense. The disorder of the federal government’s financial affairs will likely lead to even greater discord in the already divided Congress. No bi-partisan path has been proposed, and the new budget President Trump will introduce in January is unlikely to rally enough support to deal with this sea of red ink. Escalating trade war – President Trump announced earlier this week that he expects to move forward with plans to escalate tariffs on $200 billion worth of Chinese imports beginning January 1, even as he readies to meet later this week with Chinese leaders at the upcoming G-20 meeting in Argentina. Trump promises to slap tariffs of 10 percent to 25 percent on all remaining imported Chinese goods. He has already imposed a 25 percent tariff on a separate list of Chinese imports valued at more than $50 billion (the U.S. bought more than $522 billion worth of Chinese goods in 2017). Will the tariffs work? Some economists are skeptical because the Trump administration’s stance does not act to reverse the overvaluation of the U.S. dollar. The dollar has risen more than 7 percent this year against the currencies of major American trading partners, part of a 22 percent gain since the end of 2013, according to the Bank of International Settlements index. The stronger dollar makes U.S. goods more expensive for foreign markets while making imported products less expensive for Americans. What’s the effect of currency changes on U.S. trade? Since April of this year, the Chinese yuan has dropped 9.5 percent against the dollar, seriously eroding the 10 percent and 25 percent tariffs that the president has imposed on that country’s goods. A quick victory on trade seems uncertain. Inverted yield curve – Economists use the nomenclature “inverted yield curve” for when long-term interest rates are lower than short-term interest rates. When an inverted yield curve occurs, as it did just prior to the recession years of 1980, 1990, 2000, and 2008, the markets were signaling that the Federal Reserve Bank should start cutting interest rates to try and prevent a recession. Ten-year interest rates are currently a mere 0.25 percentage points above the two-year rates. Another rate hike or two should produce the inversion. The average length of time between inversion and recession is 12 months, meaning an economic slowdown could occur in the next presidential election year. So, is an economic recession or slowdown in economic activity possible? The answer is yes, because the business cycle goes both up and down. But, when this will occur, how long it will last, and where it will measure on the misery index are questions that cannot be definitively answered today. The use of police body cameras by localities has created some benefits for law enforcement, the public, and the Commonwealth attorneys. However, issues related to policies and infrastructure that are not attuned to the new technology have arisen. The 2018 General Assembly approved language directing the state Compensation Board to convene a workgroup to address issues raised by some Commonwealth attorneys regarding the need for more staff (i.e. attorneys) to review local law enforcement body camera footage to be used in the prosecution of crimes. The basis of the argument made by the Commonwealth attorneys was that State Bar ethics policy requires that an attorney review all footage related to an incident/arrest. Depending on how many officers with body cameras responded to a call or incident, and how long the cameras were recording, the amount of video footage could be voluminous. The Commonwealth attorneys’ proposal would have required local governments to pay for the additional staff. The workgroup was convened early this fall and held three meetings. At the last meeting, the group came to a tentative agreement on some short-term language that would call for either the use of a ratio of one entry-level assistant Commonwealth attorney for up to 75 body worn cameras used by local law enforcement; for every additional 75 cameras, the same ratio would apply (the original proposal from the Commonwealth attorneys was a 1:50 ratio). The proposed language also would allow a locality and a Commonwealth attorney’s office to negotiate an agreement about resources using a different formula, as needed, to accommodate the additional workload resulting from the requirement to review, redact, and present footage. This proposed language would be submitted as a budget amendment in the 2019 Session and would be in effect until a more thorough study of the impact of body camera video use is completed (see below). The proposed language would also require that the workgroup continue to study the impact of the body worn cameras on the workload of Commonwealth attorneys’ offices with a reporting date of Dec. 1, 2020. This study would look more closely at the hours of video footage received from local law enforcement and how it is categorized (felonies, misdemeanors, and traffic offenses); the number of hours spent by Commonwealth attorneys’ offices redacting video; and other information determined necessary for this analysis. Local representatives on the workgroup asked that any efforts with the General Assembly in the coming year focus first on getting the state to fully-fund its share of Commonwealth attorneys’ offices as stipulated in the Code of Virginia and the Appropriations Act. The Commonwealth attorneys agreed that this was a priority item for them. Other issues in this discussion include the ability of clerks of the court to handle the technology needed to use the footage in court and the infrastructure needed for court facilities to support the use of the technology. Finally, the state support of Commonwealth attorneys will need to be addressed as part of the proposed use of body cameras by state agencies, such as the Virginia State Police. These issues were not included in the scope of the Compensation Board workgroup; it is uncertain how, when or by whom these issues will be addressed. After a months-long review, the Virginia Department of Transportation (VDOT) has released a draft report recommending against any commitment by the state to participate in a hypothetical federal pilot study of heavier, six-axle trucks. Various industries have pressed lawmakers to consider raising the weight limit on trucks on Virginia interstates from the current 80,000 lbs to 91,000 lbs to accommodate the larger trucks. They argue that using six-axle trucks will increase efficiency in ground transportation, particularly as states farther west have eased restrictions. However, family advocates, trucking companies and insurance providers have raised concerns about the safety of operating the heavier machines on Virginia’s roads. In their report, VDOT staff cited these concerns, as well as others related to a lack of sufficient data regarding the impact to existing infrastructure, compliance and enforcement. Furthermore, VDOT staff determined that the lack of an existing federal study in which to participate rendered any firm commitments on the part of the state premature. A final report from VDOT will be released ahead of the 2019 session. Those annoying and seemingly unending political commercials interrupting our favorite television shows have gone away. The robocalls asking you for money, votes and opinions have also disappeared. But don’t be fooled by the relative calm, the political drama continues with the federal government facing a partial shutdown as early as next Friday. With the December 7 deadline looming, Congress has seven unfinished spending bills to enact for the federal fiscal year that began October 1. If the two parties and President Trump cannot agree, a continuing resolution will be needed to keep the federal government functioning. The outstanding FY19 appropriation bills make up about 25 percent (or $313 billion) of the discretionary spending subject to budget caps. The “show stopper” issue is the president’s border wall. Trump wants a $5 billion appropriation and a commitment from legislators to guarantee several years of wall construction money. Although the Republicans control both houses of Congress, through the lame-duck session until the end of the year, at least nine Democratic votes are needed in the Senate and maybe more than that in the House of Representatives to pass the spending bills. Democrats say they already have a deal on $1.6 billion in border security, limiting new funding to previously deployed and operationally effective designs. That’s not in sync with the president’s position. However, the border wall is NOT the only issue separating Democrats from Republicans, representatives from senators, and Congress from President Trump. Here is a sampling of other “wrinkles” that need to be ironed out. The Food for Peace program provides grants for food shipments to foreign governments and nongovernmental organizations to combat famine and malnutrition. The Senate, the House, and the Trump Administration all have different positions. Democrats want to block the Census Bureau from adding a question on citizenship status, contending the question will discourage foreign-born residents from responding to the survey for fear of deportation. Democrats are arguing for a policy rider to add language allowing the U.S. Attorney General to block gun purchases by individuals on a terror watch list. Democrats and Republicans are tussling over an additional $380 million in funding for Election Assistance Commission Grants to thwart computer hacking. Budget cuts and policy changes in the EPA’s regulatory programs and species preservation programs authorized under the Endangered Species Act are in the sights of Congress and President Trump. Border politics also include funding to expand the average daily population in Immigration and Customs Enforcement (ICE) detention centers and to hire additional ICE Enforcement and Removal officers. The perennial hot-button issues of including abortion benefits in the health insurance plans for federal workers and continuing the “Dreamers” program for people who were brought to the United States as children are also on the bargaining table. Emergency disaster aid to help with recovery from the hurricanes and wildfires that ravaged the country this year will also have to be addressed. Will the federal government cease operating, or will a continuing resolution put off for another day the resolution of all the issues? It would seem that the November election fell short of settling everything. Shared responsibility between local schools and private schools for progress monitoring of individual students. How a decision to return a student to a public school is made between an IEP team and parent(s) (Virginia is one of three states that require parental consent for such a decision). The lack of law/regulation in Virginia regarding any requirement that a private school be accredited (half of the VDOE-licensed schools are accredited). How and to whom would progress/outcome data be reported (current recommendation is to begin with the 2019-2020 school year but further measuring protocols are needed). The presentation was made by Scott Reiner, the executive director of the Office of Children’s Services and Hank Millward, the director of specialized education facilities and family engagement in the Virginia Department of Education. The presentation stemmed from a workgroup convened at the direction of the 2018 General Assembly, which has been grappling with the steady growth in the number of children served through the Children’s Services Act (CSA) in private day special education programs as well and the increased cost. The number of children served in the private day settings increased from 2,971 in FY2013 to 4,101 in FY2018 and CSA expenditures for private day special education rose from $101 million in FY2013 to $178 million in FY2018. Local governments pay a share of those costs under CSA. The workgroup was asked to identify and define outcome measures to assess student progress in private placement that included assessment scores, attendance, graduation rates, and return to the students’ public school. Further, the Department of Education examined rules and regulations regarding private education placements and public special education programs. As a reminder, another study of private special education is underway as well. The Office of Children’s Services has contracted for a study on the rates paid by localities to special education private day programs licensed by the Department of Education. This study, which is not due until July 1, 2019, will examine the adequacy of current rates, provide recommendations for implementing a rate-setting structure, and consider the impact on local school districts, local governments, and public and private educational services providers. Following the Supreme Court’s decision to review his standing in the case, Speaker Kirk Cox has filed a motion for the Fourth Circuit Court to suspend current efforts to redraw Virginia’s district boundaries, and to allow Virginia to move its House primary from June to September. Having added the case to its order list earlier this month, the Supreme Court likely will not hear the case until February, with a ruling not expected until mid- to late spring. Speaker Cox, filing on behalf of House Republicans, argues that the timing of the hearing will create confusion ahead of a busy primary season, and that a new district map may ultimately be deemed unnecessary. Currently, legislative primaries are scheduled for June 11; Cox has requested that the date be pushed to September 10. All House and Senate seats in the General Assembly will be up for election in November. A copy of Speaker Cox’s press release can be found here. The Virginia Municipal League (VML) presented the Gold Level Stairway to Success Award to the Town of Leesburg on Tuesday, November 27, 2018 during the town’s council meeting. Rich Williams, Town of Leesburg Parks and Recreation Director, accepted the award. Leesburg earned the award for allowing the use of government buildings for preschool activities, such as “A Room to Grow” held at the Ida Lee Park Recreation Center (where the award will be displayed) as well as displaying art by preschool students in public buildings, sponsoring workshops and activities supporting childhood nutrition, healthy eating, physical fitness, and hosting preschool performing arts events. Former VML President and Town of Blacksburg Mayor, Ron Rordam established the Stairway to Success initiative to honor localities for engaging in actions that enhance the early childhood experience and to encourage local government involvement in early childhood education. Nominations are being accepted through Monday, December 17, for the 2019 Excellence in Virginia Government Awards, sponsored by the L. Douglas Wilder School of Government and Public Affairs at Virginia Commonwealth University. EVGA celebrates people and organizations in the public and private sectors who have made significant contributions to the practice of government and the well-being of Virginia’s communities and citizens. Nominations are being sought for six awards: Community Enhancement, Hill-Robinson Expansion of Freedom, Innovation in Government, Private-Public Partnership, Unsung Heroes, and Lifetime Achievement. Nominations should be submitted online. An awards luncheon will be held April 11, 2019 at the downtown Richmond Marriott. For questions regarding the public nominations process, contact Paula Otto, the Wilder School’s senior director of special projects, at piotto@vcu.edu or (804) 828-1146.